The Velombra sail awnings are theresult of an intense research, which combines nautical technology with comfort and design. While they can be completely rolled up in a few seconds thanks to a motorized or manual mechanishm, these amazing systems protect against the sun and rain and are resistant to salt corrosion thanks to the extensive use of marine-grade stainless steel, anodized aluminum and Dacron® (standard white color), the same fabric used for sailboats. Defender is a shading system with a surface of 120 or 150 square feet, available with ground pedestal or with wall mounted support. With the pedestal it is possible to rotate it 360 degrees, while on the wall can be rotated up to 90 degrees. The canvas can be rolled up in a few seconds manually or with an optional radio-controlled motor. Upon request, a motorized Defender can be equipped with an optional wind sensor, allowing the system automatically close in case of high winds. X-tension is a range of roll-up covers, totally custom made and suitable for the shading of very large areas (up to 800 square feet per awning). They can be used in various combinations to create some spectacular effects. Supported by stainless steel posts or wall brackets, they can also be installed on pre-existing anchoring elements, such as walls, columns, tress, etc. They can be retracted manually or by an optional motor, using a radio-controlled motor, while an optional wind sensor can ensure automatic closing in case of strong winds. 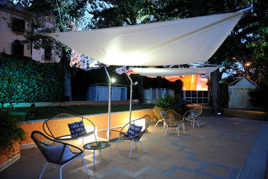 Intrepid is a self –supporting shading system without need for ground anchors, which is supported by four aluminum posts, two of which sustain the roller tube and the other two (motorized) allow the opening and closing of the awnings. Fitted on request with an adjustable-height wooden deck, Intrepid includes two retractable sail awning on an anodized aluminum profile and is available in four different sizes.